Three components in a convenient box for reliable mould removal. Contains 1 x 500ml spray bottle of Mould eliminator 412, 1 x 500ml spray bottle of AURO Mould stop 413 and 1 litre of AURO Anti-mould paint 327. Three components in a convenient box for reliable mould removal. Contains 1 spray bottle of Mould eliminator No. 412, 1 spray bottle of AURO Mould stop No. 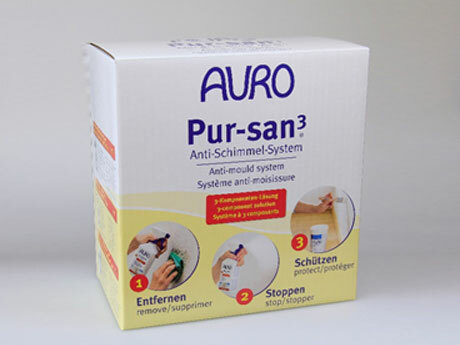 413 and 1 l of AURO Anti-mould paint No. 327. Apply Mould remover, Mould stop and the Anti-mould paint according to the instructions on the product labels.